B S Haulage Contractors Ltd is a small family run business which has been operating for 12 years. 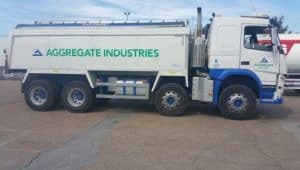 The company is based in Purfleet as a subcontractor to Aggregate Industries, delivering asphalt and aggregates across London and the South East of England. When Bhapinder Rai, Transport Manager was initially introduced to FORS in 2013, he knew instantly that this was something that would take the haulage industry up to a whole new level of standard. I had a feeling that construction sites and new projects within London would ask for FORS only vehicles on their sites. This would then provide a much safer working environment within any contract site. Becoming a FORS member was not only for contractual reasons but also enabled us to contribute to making the roads a lot safer whilst trying to minimise our carbon footprint. We first came across FORS at the CLOCS show. Initially started in London I am not Surprised that FORS has now been extended across the country. 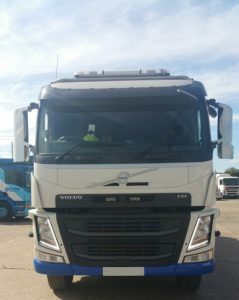 ‘The first thing we did to meet FORS criteria was to make changes to our vehicle. We upgraded our vehicle to include side under run bars, left turning warning audible speaker, side proximity sensors, passenger side Fresnel lens and warning stickers to the side and rear of vehicle. With the addition of these new features, an immediate benefit was that the vehicle became safer for vulnerable road users’ states Bhapinder. Our first bronze assessment was in 2013 in which we passed with a 100% mark. This gave us a great deal of satisfaction, as we already had good systems and procedures in place. However, I felt that there was so much more that FORS could offer and so I decided to attend the FORS practitioner course. I found the classes very informative and would recommend them to anyone wanting to gain further knowledge about FORS and what it aims to achieve. The course tutors were also very helpful, as they had a lot of knowledge regarding the Haulage Industry and all questions were answered thoroughly. The classes are designed to be interactive with everyone finding it easy to participate. The practitioner courses also gave me an insight on how to progress to Silver & Gold standard. “Initially started in London I am not surprised that FORS has now been extended across the country“, explains Bhapinder Rai, Transport Manager. As a FORS Bronze accredited company, we were able to take advantage of the benefits on offer. The FORS scheme has been helpful in providing the tools for companies to progress. These can be found easily on the FORS website. The Safe Urban Driving and Staying Legal Courses were extremely beneficial in helping us improve safety within our business, while the online driver training provided our staff with extra training. Since joining FORS, we as a company have greatly benefited from more contracts as a greater number of construction companies are requesting FORS only vehicles on their sites. This has led to an increase in revenue for the company whilst enabling us to contribute to keeping London’s roads safer. We have also improved our fuel consumption greatly as FORS has helped us achieve a fuel saving of 10% in the last 3 years. A tracking system on our vehicle informs us of vehicle idling which I feel is one of the main causes of air pollution in the city. We currently receive alerts for vehicles idling for five minutes. However, we are looking to reduce this to three minutes. Having a vehicle tracking system in place also enables us to direct the vehicle to take certain routes in order to avoid cycle hotspots and schools at peak times. Using the trackers also means less fuel is wasted by vehicles taking wrong continues. “FORS has helped us achieve a fuel saving of 10% in the last 5 years”, explains Bhapinder Rai, Transport Manger. Achieving Gold FORS standard means BS Haulage Contractors Ltd continues to improve on fuel consumption whilst continuously striving to make the roads safer for vulnerable road users. We can achieve this by keeping up to date with vehicle improvements as well as using telematics to reduce our carbon footprint. I feel that achieving Gold FORS as a small company will give other small businesses the confidence to also strive to achieve this standard. FORS has encouraged and supported our progression through the FORS levels, and we are proud to be one of the smallest companies to be awarded FORS gold status. However, our journey does not end here, as it’s all about continual improvement and ensuring we remain proactive in implementing best practice and developing our drivers. The FORS scheme is of great value to any freight business operating in London, or anywhere else, come to that. FORS Gold status is achievable for any business, big or small. We encourage all small businesses to achieve FORS gold.